Chainnose pliers can be used for all sorts of things, including breaking off beadwork, as demonstrated here. Jump rings are circles of wire that are used to connect one object to another. You may purchase jump rings or you may create your own. 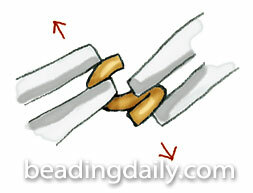 To open a jump ring, grasp each side of its opening with a pair of pliers. Don’t pull apart. Instead, twist in opposite directions so that you can open and close without distorting the shape.